Four years ago when I did the battery powered chainsaw shootout for Pro Tool Reviews, we could only find four competitors in the 36-volt or higher class. But now, with a burgeoning battery-powered outdoor power equipment (OPE) market, we had to narrowly define the test criteria to keep the test to a manageable size and to also make sure the saws were fairly evenly matched. Smaller chainsaws under the 36-volt power class have always failed to impress. So to find the best battery-powered chainsaw, we only included tools 36 volts and higher. The saws had one other simple qualifier for this test. They had to have an active chain brake—not just a plastic guard in front. A few saws were bumped out of consideration for lack of this essential safety feature. The models that ended up in the test are pretty similar. They feature brushless motors and have 16-inch bars (with one 18-incher), and all are available in kits with one battery and a charger ranging in price from ~$210 to a little over $400. There are other battery-fueled chainsaws available at higher price points, but we focused on the more affordable range for this shootout. So you could really say that what we’re dialing in is the best battery-powered chainsaw under $400 (ish). This article originally published on February 28, 2017. Newer models may have been released that are not covered here. As readers of Pro Tool Reviews know, battery voltage itself doesn’t determine the power output of cordless tools like it used to. Lithium-ion cordless tools have always used electronics to regulate battery output, but with the advent of brushless motor tools, greater tweaks can be made between the battery pack and motor. Computer chip controls within brushless motors can freely convert the voltage to prioritize the current levels needed for balancing high power output with the heat management that is so critical for lithium-ion cells. Add to that the trend of tool companies becoming increasingly nebulous with their voltage naming conventions, and voltage numbers mean less now than ever. The tools in our test range in voltage from 40V Max – meaning 40 volts maximum charge but 36 volts nominal – to 80V Max with 72 volts nominal. They come equipped with anything from 2.0 to 5.0 amp-hour (Ah) packs. Despite having mixed voltages and amp-hour ratings represented, there was no handicapping. All of the saws considered for the title of Best Battery-Powered Chainsaw are full-size tools as the category goes. Our shootout was a free-for-all, rewarding superior performance over all other considerations. Creature comfort and accessory features add nice touches, but getting the job done quickly with power to spare was our top priority. The practical way to gauge the relative power of these chainsaws is to record the cut speed of each one through a series of identical cutting trials. This means using the same materials, feed pressure, and cutting technique throughout each trial. It also means fitting the saws with sharp new chains at the beginning of the recorded trials to eliminate chain wear as a variable. Of course, we can’t quantify how strong each saw is exactly, but we know which ones get the job done the fastest and that’s what we’re looking for. The other side of the performance equation is runtime. The more work a tool can perform on a single battery charge, the less hassle you have by switching the pack out or waiting for it to charge. For fuel efficient tools like impact drivers and other 18-volt tools, runtime is not a big deal. That is, so long as you can’t outpace your charger! Since these chainsaws only come with one battery pack, and users aren’t as likely to have spares of these larger batteries around, runtime is especially important. Multiplying the number of cuts these saws can make on a battery charge times the cutting times provides a rough estimate. These saws only have about 6 to 12 minutes of work in them when cutting wood diameters up to half the cutting capacity of a 16-inch bar (about 7-1/4 inches). 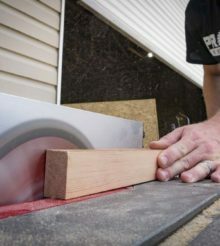 For the go-getters in the test, those scant minutes of trigger time can add up to a fair amount of work with over ninety such cuts, but the saws that lag behind might require you to finish your cutting chores the next day. Charging times vary. Kobalt claims a 30 minute charge time for their compact 2.0 Ah pack, but Oregon says that their 4.0 Ah pack requires four hours in the charger. Ouch. As you’d guess, the best battery-powered chainsaw should have a good balance of cutting speed, runtime, and efficient use of its battery. Over a few months of testing, I made many thousands of cuts of through softwood and softer hardwood species. These ranged from three to nine inches in diameter. Most of the recorded cutting trials were done in fresh Ponderosa pine trunks that I felled up in the mountains for the shootout. I primarily used the chainsaws for crosscutting in green (wet) wood like their chains were designed for, not in dried construction lumber. My favorite saw of the bunch made it out with me to a few tree removal jobs, but for the most part what I ended up with was a dozen garbage barrels of thin wood disks for the fireplace and a dozen barrels of sawdust for a local horse barn. All those hours of cutting really put the saws through their paces. With the benefits of battery power, however, I didn’t risk going deaf, inhale clouds of harmful exhaust, or bug any neighbors with noise and fumes. The other part of this cleaner, greener story is that I use a biodegradable bar and chain oil made of vegetable-based ingredients. Those barrels of useful wood waste I mentioned also contain a few gallons of oil from the saws. I decided to switch to bio-oils a decade ago after seeing the huge pile of sawdust I generated during a chainsaw test sit outside for years in my compost area without decomposing. Besides the added responsibility of having to landfill all of your petroleum-preserved sawdust, it’s good to minimize your exposure to petroleum oil on your skin, clothing, and the atomized portion that you breathe in. There are at least a couple of brands of bar and chain oil available that are biodegradable, but I’ve found Stihl Bio Plus to be a reliable, premium product. Plus, it’s easier to find than any other brand of bio-oil. The saws tested are similar in form and share all of the same basic operational features, but where they differ in form is primarily in their switches and triggers. All of the saws have a UL or similar test lab certification on them, but they seem to be tested to different variations of the acceptable safety trigger standard. The current UL standard requires an electric chainsaw to have a trigger with “two separate and dissimilar actions required” to start the chain moving. An engineer from a major chainsaw manufacturing company explained to me that this means a chainsaw should not be able to be triggered “on” with a single grabbing motion of the handle and trigger, rather the trigger lockout mechanism and the trigger require separate deliberate actions. I’m not sure what’s considered acceptable or not by the major listing labs out there. In use, it’s easy to determine that some of the saws in our test have actual two-step triggers while others can be easily activated with a single grasp around their lockout button and trigger. At the end of the day, we expect the best battery-powered chainsaw to have a trigger mechanism that will keep us safe in all chainsaw applications. The Greenworks Digi Pro and Kobalt saws have electronic power buttons which add a distinct step, while the Echo and DeWalt saws were designed with mechanical lockout switches (with DeWalt’s being the most foolproof). But with the EGO, Greenworks Pro, and Oregon saws, ou can pretty much just grab and go. The true two-step lockouts aren’t difficult to operate in normal conditions. In odd positions, such as reaching around a tree while limbing, sometimes the mechanical lockouts can be tricky to slide. The electronic switch saws can be run with a single grab once they are powered on, but since the Greenworks Digi Pro times out after one minute, and the Kobalt after only 16 seconds, it can be frustrating the pull the trigger to no effect when you thought the saw was ready. Another feature tied in with the electronic switches are warning alerts. Small LED “ready” lights glow on the dash of two of these saws accompanied by a few chirps when you turn them on. There are also separate warning lights that indicate trouble conditions. The Greenworks Digi Pro flashes an alarm whenever the brake lever is applied. That’s okay, but the insistent chirping sound will make you switch off the saw long before its one-minute timeout interval. This can dissuade a user from relying on the brake as a safety device when adjusting or carrying the saw around as should be the habit. The Oregon saw has a more useful brake alarm that only beeps after the brake is activated during use or when the trigger is pulled with the brake applied. Chainsaw bars need to be adjusted nearly every time you use the saw. A new chain will stretch out pretty quickly and will need to be snugged up at least a few times before it’s broken in. If your chain gets tight rather suddenly, it usually means the bar is not getting oil so don’t loosen it until you make sure the saw is oiling properly. Pro Tip: Get into the habit of loosening your chain at the end of the day. Cold weather can cause it to tighten as it cools and damage parts. A saw’s bar will be designed for either tool-free adjustment or will require a screwdriver-wrench combination tool called—yep, you guessed it—a scrench. Tool-free adjustment is the quickest and easiest with plastic knobs and/or dials built into the saw used to loosen the bar, move the bar forward or back to properly tension the chain, and lock the bar down tight again. The DeWalt, EGO, Greenworks Digi Pro, and Oregon saws are all tool-free. All work well enough, but the slender tensioning dial on the EGO is more difficult to adjust than the larger knobs of the others, especially with gloves on. Tool-free chain tensioning uses knobs and dials built into the side of the saw. The big knob below snugs the bar down and the dial above moves the bar forward and back to tension the chain. This method is a bit quicker than relying on an adjustment tool and is used on small and medium sized chainsaws for convenience. Saws with tool-free adjusters use a single stud (a.k.a. captive bolt) to attach the bar to the saw, but the tools in the test that require a scrench have two mounting studs. Some old-school users view dual studs as an indication that the saw is geared toward professionals, but I don’t think that’s a hard, fast rule. Not for modest-sized saws anyway. I do know, however, that the biggest and strongest chainsaws made all have dual stud bar mounts. Our Echo, Greenworks Pro, and Kobalt saws have dual studs, and the wrench end of the scrench is used to tighten the bar nuts onto them. The screwdriver end is used for chain tensioning via a screw head located between the two studs. Be sure to snug the nuts evenly because torquing down on only one can loosen the other. Traditional chain tensioning requires the use of a combination screwdriver/wrench called a scrench. The bar is loosened and tightened with the wrench end as shown, while the chain tension is adjusted with the slotted bolt just below the bar nuts using the screwdriver tip. This method is a bit slower but strong and reliable. Lost bar nuts are a frequent occurrence during regular use in the field so carrying spares is a good idea. To prevent this, the Greenworks Pro has the added feature of captive nuts that won’t vibrate off. And to keep their adjustment tools close at hand, the Echo and Kobalt saws have storage slots built into the saws, although the Kobalt’s flat scrench fell out easily during use. Pro Tip: Snug the bar nuts down evenly to avoid having one come loose. Even with good tightening practices, keep a spare nut on hand as it’s not unusual to lose one in the field. User preferences vary, but I can appreciate both adjustment methods. I like the speed and convenience of tool-free adjustments for my small saws. For my big saws, I feel more confident securing the business end of these powerful tools down with a wrench. It’s not a deal breaker either way for the saws in our test. The best battery-powered chainsaw for you will be the one that instills a sense of both confidence and convenience. Like most chainsaw brands, the companies in this test didn’t try to reinvent the wheel by making their own bars and chains. Instead, they spec’d common Oregon components. Each saw uses a low-profile 3/8-inch chain with a few minor differences. The DeWalt, Echo, EGO and Greenworks Digi Pro saws all use Oregon 90 chain with .043-inch thick drive links, while the other three use variations of the similar Oregon 91 chain with slightly thicker .050-inch links. The Kobalt has the standard 91 chain while the Greenworks Pro comes with a skip-tooth version. With only half the cutting teeth, the skip-tooth chain is cheaper and demands less of the saw, but of course, it cuts noticeably slower. The Oregon saw uses a special 91PS “PowerSharp” chain which works with the saw’s built-in semi-automatic sharpener. Pulling a lever atop the saw pushes a curved sharpening stone against the special chain for easy sharpening on the fly. The aggressive, hooked teeth of the PowerSharp chain can be too brutal in some woods, so standard Oregon 91 chain can be substituted—just don’t try to use the sharpener with it. Bar and chain oil is the lifeblood of a chainsaw as the saw cannot run without it for very long. Throughout the testing, most of the saws oiled readily, but one of the DeWalt 40V Max saws stopped oiling twice over the months. I also experienced chronic problems with the Greenworks Pro. The DeWalt was fine after routine cleanings of the oil hole going into the bar, but I’m not sure why this saw clogged while the others kept oiling, or why this only happened to one of the two identical saws from DeWalt in the test. Whenever the Greenworks Pro refused to oil, it was another puzzlement. With the tank half full and all of the oiler holes clean, it still wouldn’t pump oil out to the chain, though a lot of dripping oil was evident at the back of the bar. I finally discovered that the oil would only feed properly with the tank all the way full. So even if its tank has oil inside, this saw requires the extra step of checking frequently if it’s still oiling. The saws all feature translucent windows that let you check if there’s oil in the tank, and most let you estimate the level pretty well except for the Oregon’s, which is way too small. The ease of filling the oil reservoir is a noteworthy convenience factor when considering the best battery-powered chainsaw. I don’t like having oily fingers so being able to fill the tank while leaving my work gloves on is my preference. Most of the tools have oil caps with lugs that are easy to turn with gloves on, and the DeWalt and Greenworks Pro have flip-up tabs that provide an even better grip. Be careful when filling the DeWalt chainsaws. Their handy, quarter-turn caps are the quickest to open and provide the widest pouring access, but the large section of the cap that goes inside the tank displaces a surprising amount of oil when you fill it anywhere close to the top. Wiping gooey oil off a chainsaw is an annoying waste of time. Another cause of spills is an oil tank with a filler neck that is too narrow. Bar and chain oil is thick and tacky and can pour like molasses in the cold, so it easily “piles up” and overflows in a narrow neck. Filling most saws proved passable, but the Kobalt’s upright fill design has a narrow neck cocked at an angle which makes the target even smaller. Also providing a challenge, the EGO saw is the only one with a plastic filter at the inlet of its tank, but it constricts the diameter too much. And what’s more, its cap cross-threaded often, making the oil-fill process more of a chore. Here’s a tip, only poke a little hole in the foil sealing your quart or gallon oil bottle so you can pour a skinny stream, or do what I do and dispense your oil from a syrup bottle that has a tapered, pull-to-open tip. It works like a charm, and you can push the tip against the inside of the filler neck to stop the flow for one-handed control when your other hand is steadying the saw. Pro Tip: Only poke a small hole in your bar oil bottle to keep the stream more controlled. Alternatively, a thoroughly cleaned syrup bottle will allow to squeeze the oil through the small hole in the cap. Chainsaws are known for leaking oil while sitting because the daily heating and cooling cycle of their surroundings shrink and expand a plastic tank like a rudimentary pump. Some of our saws were messier than others. After sitting awhile in the shop, the Kobalt and especially the Greenworks Pro saw had noticeable puddles underneath them. If put away with a full tank, the Greenworks Pro would soon leak a huge amount of oil—as in ounces. Adding to the messiness of the Kobalt, the vent hole in the top of its oil tank cap freely drips oil whenever the saw is tilted sideways for adjusting the bar and chain. Naked? Don’t Use a Chainsaw Like This Guy! For pushing a saw through wood more efficiently, chainsaws are fitted with bucking spikes (a.k.a. bumper spikes, felling spikes, or dogs). These spikes sit against the body of the saw alongside the bar and are used to anchor the saw in place while the bar is pivoted through the cut with a lifting motion of the rear hand instead of it pushing downward. With the saw held tight to the wood, it can exert its maximum pulling power, and the user is saved from some of the cutting vibration and especially the jerking common with a saw held away from the work. Our battery-powered saws all have some semblance of spikes. None are as long or as sharp as those on large gas saws, but actual steel spikes are found on the Greenworks Digi Pro, Kobalt, and Oregon saws. The Greenworks Pro has aluminum spikes and the Echo has plastic spikes. These will all grip on bark, and even to bare wood and lumber to some degree. Far less grip is available with the small plastic ridges found across the front of the DeWalt and EGO saws, however. Applying leverage with spikes adds control, but go easy and listen to the pitch of the motor. These modest saws are fairly easy to overload with too much pressure, and the weakest among them stall readily when levered into a cut. While all of the saws in the test come with basic plastic scabbards to protect the chain while also protecting you from the chain, a few of the models had extra features and accessories not mentioned elsewhere. Following the traditional design—perhaps blindly—of gas chainsaws that need to idle and rev, the DeWalt 40V Max, Echo, and Greenworks Digi Pro saws feature variable speed triggers. The smoothest cutting is done at the highest chain speed, even for small limbs, so I’m not sure of the utility of this feature on electric saws. On the other hand, a feature I think all chainsaws could benefit from is a coast-down brake like those we rely on with circular saws and miter saws. These useful brakes are found on the DeWalt Flexvolt and Greenworks Digi Pro saws. The Echo saw comes with an optional tip guard to make the safe operation of their saw more foolproof. Attaching the guard makes you lose a few inches of cutting capacity and prevents any plunge cuts and other non-through cuts such as deep rips, but casual users may feel more comfortable with the tip of the saw fully protected against kickback. And finally, the Greenworks Digi Pro comes complete with a unique, form-fitting, zip-up fabric bag/case. I don’t quite know what to think about this because I just learned these existed while unpacking it from the box. While it’s true that the comfort and feel of a tool are largely subjective, it’s also true that some designs work better than others. The experienced tool user can immediately tell. I believe that thoughtful design intention and execution do come through for the majority of users. For the best battery-powered chainsaw, a balanced feel in your hands and the ability to cut straight without introducing a twisting motion for the user to overcome are both important ergonomic factors. Holding a saw with your left hand on the front handle in front of you should have the saw balancing fairly flat. Being a bit front heavy is okay, but a rear-heavy saw lifts the cutting end of the saw up towards the user and requires more effort and vigilance to use and carry safely. For this bucking grip (cutting vertically), the Echo rates Very Good, the DeWalt, EGO, Kobalt, and Oregon saws Good, the Greenworks Pro Fair to Good, and the Greenworks Digi Pro Fair. Determining a good feel for felling cuts with the saw held sideways is more about the comfort of applying force to the front and rear handles when grasped from the side, and also the ease of operating the trigger while sideways. For the felling grip (cutting horizontally), the DeWalt, Echo, and EGO saws rate Very Good and the Greenworks Digi Pro, Greenworks Pro, Kobalt, and Oregon rate Good. 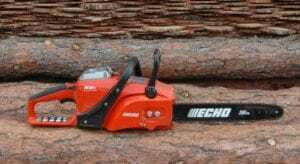 In general, chainsaws with thicker handles are more comfortable to grasp in use because their broader radiused edges serve to soften the contact with the user’s hand. And of course, rubber handle surfaces help too, not only for padding but also for the increased grippiness they provide. The front and rear handles of the DeWalt saws are the widest of all. Their generous size and full-wrap rubber grips on the rear handle stick them solidly in hand. A strong grip could be had on most of the saws, but the front and rear handles of the Greenworks Pro feel too skinny. And the rear handle of the Oregon is too slick, as it’s the only saw lacking a rubber grip surface for the trigger hand. One other problem for grip comfort of the trigger hand was the protruding lockout button of the Kobalt which digs into a user’s thumb in use. Even worse, the harsh corners on the switch dash of the Greenworks Digi Pro often push against both sides of a user’s hand. Triggers were mostly sized large enough for two fingers to fit on them, but the extra long trigger of the EGO saw had room for more which allows the user to vary their grip stance for comfort. The best feeling trigger was that of the EGO saw. It’s wide and flat, and when squeezed it retracts flush with the handle instead of leaving a raised bump your fingers have to push against. The dry weight of saws in our best battery-powered chainsaw shootout range from 12.15 to 14.41 pounds. Experience shows that a saw’s weight is less important than proper balance overall as you only feel the weight when you are NOT cutting. But carrying around and positioning a heavy saw can certainly be more taxing over a long workday. The catch with these saws is that the batteries are a major part of the weight. So the stronger, longer-lasting saws with high-capacity battery packs that we prefer are among the heaviest, with the exception of the Kobalt with its longer bar and chain which make it the heaviest overall. Curious about the voltage inflation implied when a brand uses the word “Max” next to their named voltage, I checked the voltage of each battery fully charged, after eight cuts, and after being fully depleted. As expected, most settled in below their named voltage after doing a little bit of work, but no brand seemed to be taking great liberties. At the very least, the “Max” numbers were not exaggerated since each battery charged to a level slightly higher than the battery’s named voltage. The batteries discharged to voltages from 84% to 74.5% of their peak voltage (fresh off the charger) before shutdown. It follows that, the lower this percentage, the deeper the discharge and the more the tool is getting out of the battery. It’s interesting to note that some of the longer runners posted lower percentages. But since this cutoff level can be programmed into a tool’s electronics, it’s difficult to discern any reliable performance metrics from these readings. Here’s a look at the starting voltages and how it changes after 8 cuts and at battery shutdown. So if you believe that a company’s watt-hour rating is accurate, you can divide it by the battery voltage to determine the actual amp-hours. But which voltage number? The nominal, or Maximum, or something in between? Also, we’re increasingly finding that manufacturers, perhaps to simplify things for consumers, are rounding amp-hours as well. This further adds to potential confusion. As you would expect to be the case, the numbers from some saws line up if you calculate them based on their nominal voltages. This is true for the Kobalt and Oregon batteries, and the Greenworks Digi Pro is really close too. Similarly, the EGO checks out—if it’s really at 56 volts. However, DeWalt’s numbers are based on their 40V Max truly being 40 volts. Likewise, Greenworks Pro calculates as if their 60V Max is truly 60. For DeWalt FlexVolt, their nominal 18V voltage combines with a 9.3 amp-hour rating to yield their 167 watt-hour rating. Accurate specifications are getting harder and harder to state. One other thing to consider is the maximum capacity pack you could buy after the fact. Some of these higher capacity packs are kitted with lawnmowers or other high-demand tools but could also be purchased individually. If you end up investing in the entire lineup, you’ll likely want to consider the biggest battery you can buy for it. Some European countries regulate stated voltages more stringently, and it seems that it could only serve to help if the simple math all added up. For our purposes, we’re putting everyone on an even playing field by taking the nominal voltage and stated amp hours. It’s only a minor annoyance, however, as the more telling results are all products of our hands-on testing. For our speed test, we took the average speed of cut in 8-inch pine with the bark removed. Unlike our cordless recip saw shootout, wrapping a weight around a chainsaw isn’t an option. I took the times once I had a safe, repeatable cutting method dialed in. There was a pretty large disparity in cutting speed from the fastest to the slowest cutters. Three saws managed to break the 6-second mark cutting through our 8-inch pine logs. Echo topped the list at 5.38 seconds, followed by EGO in second at 5.76 seconds and DeWalt FlexVolt rounding out the top three with an average cut speed of 5.93. Both Greenworks saws failed to break the 10-second mark with the 60V Max model taking the longest at 12.69 seconds and the 40V Max needing 10.26 seconds. Oregon snuck in just under the mark at 9.94 seconds. For runtime, each of the pine logs I used was 7-1/4 inches in diameter. To ensure that heat didn’t become an issue, I made five cuts with the trigger held down continuously, paused with the trigger off, then made five more cuts like before. At the end of the second set, I moved on to the next saw and rotated through the group until coming back to it. There were some changes in rankings for the runtime test for many of the saws, but the top spot remained unchanged. Echo took first, making 97 cuts on one charge. DeWalt’s 40V Max chainsaw moved up to second place with 92 cuts using its 6.0 amp hour battery. Finishing off the podium, EGO completed 91 cuts on its 5.0 amp hour battery. What really stands out among these results is that Echo has the lowest battery capacity among these top three runtime performers. Getting the fewest number of cuts fell to the Greenworks Pro 60V Max with just 29 cuts on its 2.0 amp hour battery. Kobalt —another 2.0 amp hour battery pack model—made it through 35. Oregon came in with 47 cuts using its 4.0 amp hour battery. When determining the best battery-powered chainsaw, runtime isn’t everything since there are multiple watt-hour configurations in the group. When we boil it down to how efficiently each saw uses the watt hours it has, things become a little more clear. The big deal is that it evens out the differences in voltages and amp hours. It is certain that Watt hours affects run-time in lithium-ion batteries. This is especially helpful when deciding if you should jump into a battery platform with a higher capacity battery available than the one that comes with the kit. Echo bested the group making nearly 0.50 cuts per watt hour while DeWalt’s 40V Max and FlexVolt chainsaws ranked 2nd and 3rd as the only other two to break 0.40 cuts per watt hour. On the other end, Kobalt’s 80V fell short of 0.25 cuts and Greenworks’ 60V Max model was also unable to eclipse the 0.30 cuts per watt hour mark. As mentioned at the beginning, proven performance reigned supreme in our evaluation. The combination of fast cutting and a long runtime—runtime being pretty important for one-battery kits—outweighed any comfort and convenience features alone. However, there was no compromise found. The better performing saws also generally rated better in the design details which make a chainsaw more comfortable and easier to use. The best chainsaws immediately made themselves known when working side-by-side with the competition. Also, a pretty clear separation existed between the second-tier saws and the low-end performers throughout the comparative testing. Indeed, when all of the performance trials were tallied, the numbers held no surprises for the overall rankings. The Echo is the overall winner with top scores in both cutting speed and runtime. It was fast and smooth through all cutting chores. It felt the most capable of maintaining its chain speed under load without any hesitation. This gave it the feel of a real pro saw for lack of a better description. The EGO chainsaw is also definitely a top-tier performer. Its combination of speed and runtime numbers place it near the top. Like the winner, this is another exemplary saw with no significant flaws to count against it. The DeWalt saws make up the second tier of saws. They are solid performers where it counts but not faultless. The Flexvolt model is a very fast cutter with respectable runtime while the 40 volt max saw outfitted with the 6.0 Ah battery ran slower. Still, it posted runtime numbers up with the top saws. The identical 40 volt max saw that comes with the 4.0 Ah battery was a step below its brandmates in both speed and runtime output. Next in line is the surprising Greenworks Digi Pro. Though the smallest, lightest, and least expensive saw in the test, it proved a decent performer. Not on par with the upper half of the tools tested, it performed well enough to be considered the bargain choice of the category. The remaining three saws trailed the rest with shortcomings in runtime, speed, or power that overrode their other attributes. The Kobalt and Greenworks Pro saws with compact 2.0 Ah batteries suffered low runtimes, with the latter being the first to quit as well as the slowest cutting saw overall. The oversensitive Oregon saw was plagued with constant stalling which pretty much singlehandedly defined the experience of using it. One other consideration for these saws is the system of battery-powered OPE to which they they belong. Like other cordless tools, all of the models in our test can be purchased as a bare tool at a significant savings over the kit form we tested. If you’re already invested in one of these systems, the overall test winner may not interest you as much as seeing how the saw from your brand performed. Though not on top, it may be good enough for your needs, considering the extra expense of a battery and charger required when switching brands. For some of the brands, battery packs with a higher amp-hour rating are available which can provide a boost in runtime and possibly faster cutting speed. These larger batteries are sold as upgrade accessories or typically come with the lawnmower in an OPE system. If you haven’t bought into a system yet and may pick up more outdoor power tools in the future, it may be wise to check out the entire lineup from a brand. Make sure they can fulfill your wish list before going after just the chain saw. For many users, the saw is likely to be a secondary tool when compared to the hours you spend with a string trimmer or mower. To complement the saws that occupy the recommended range of our test, the Echo, EGO, and DeWalt 40 volt max systems all have pretty full lines of other battery-powered OPE. For now, however, DeWalt lacks a mower. And of course the DeWalt Flexvolt has a huge line of cordless construction tools backing it. The Flexvolt battery remains compatible with the brand’s 20 volt max line as well. There was a significant gap between the top half of our saws and the bottom half, making a clear delineation matching the performance tests. What also stands out is that the best battery-powered chainsaw also held a clear advantage over number two through four, making its claim pretty legitimate. The Greenworks Pro 60V Chainsaw failed to get any momentum out of the starting gate. It scored poorly in each of the performance tests, and its ergonomics and feature set didn’t compare as well to the others. There’s hope for those of you that already own this model in a couple of areas, though. First, an upgrade to the chain is in order. Moving from the skip tooth chain that comes on it may give you an immediate performance boost. The available 6.0 amp hour battery will also help extend the runtime and likely the efficiency as well. The Kobalt 80V Max chainsaw—twin brother of the Greenworks 80V model—also had a hard time moving away from the bottom of the pack in each of our tests. As the heaviest and least efficient saw of the group, there were few high points. It did manage to break the 10-second mark in our speed test, though. You also get an extra 2 inches of bar length over the others in this class. The addition of steel bucking spikes is a nice feature that I wish all of these chainsaws had included, and Kobalt’s 5-year warranty is among the best in the industry. Oregon didn’t compare too well in the performance tests. It does have Oregon’s PowerSharp onboard chain sharpening system, but also the least visible oil window. It also lacks a rubber grip. Oregon was the worst in practical usage. Many of our tests involved stalls which factored into the times. Oregon also produces one of the lighter saws, coming in under 13 pounds with the battery installed. This model includes my preference of steel bucking spikes, but I found them difficult to engage. Perhaps a surprise in the group is how well the Greenworks Digi Pro 40V Max Chainsaw did, given that it’s been around for several years now. Speed and runtime left something to be desired, but it did manage to stay out of the cellar in both categories. We also felt the coast down brake to be a standout feature. Even though it rounds out the bottom half, the 40V model was our lightest saw in the group and includes a chain brake. It also moved into the top half of the rankings when it comes to battery efficiency. The DeWalt FlexVolt chainsaw is part of the company’s new FlexVolt 60V platform, but there’s some question where it fits since the 40V tools are allegedly geared toward Pro landscapers. DeWalt is designing the FlexVolt OPE for the property owner and contractor that needs to clear the jobsite from time to time. Given that perspective, the chainsaw had a successful debut. The FlexVolt chainsaw stayed in the top half for every performance test and carried with it one of our top-rated feature sets. The coast down brake was a favorite. The only real point of contention is that we’d like to see steel bucking spikes instead of the plastic ridges that are currently on it. Worth pointing out is that it jumped out more than 15 points ahead of 5th place to create a firm line between the haves and the have-nots. The DeWalt 40V Max chainsaw spent some time in the woods with Jack Plating last year, so we knew it would compete well in this group. It definitely benefits in runtime with the 6.0 amp hour battery pack, but that also pushes it out above the $400 mark. The 40V model had a little bit of a stutter out of the gate, coming fourth place in the speed test with a significant gap to the top three. From there, it recovered nicely, scoring second place finishes in both runtime and battery efficiency. It is one of the heavier saws in the group but is near the top for ergonomics. Outside of the price, there’s little to complain about with this model. In a truly tight race for second place, I almost had EGO pegged as the winner a few times. In my initial tests it posted greater runtime than the Echo, and often tied or beat the Echo’s speed in some of the individual trials throughout. As an all-around solid performer, the only place it really slipped was in the efficiency category. Still, held up in runtime by the kitted 5.0 amp hour battery, it also came in a confident second place in cutting speed. With a kit price of $299 and a 5-year warranty at The Home Depot, it’s one of the best values in the group. Echo took first place in the speed test with a decent gap to second place and never looked back. It left every other saw in its wake in run time and efficiency, using only a 4.0 amp hour battery. It was also the only chainsaw in the group to receive Very Good ratings for both bucking and felling grips. Its performance left a 15-point gap to second place. There were just two areas where Echo didn’t come out on top. It’s toward the bottom of the pack for weight—hardly a major issue in this class of tools. It also comes with plastic bucking spikes rather than the steel ones I prefer. With one of the best feature sets in the group and price of $299 at The Home Depot, not only is the Echo 58V Chainsaw the best battery-powered chainsaw under $400, it’s also an outstanding value. Craftsman and writer Michael Springer specializes in testing tools and covering the tool industry for construction and woodworking professionals. Based in Boulder County, Colorado, but going wherever the story takes him, Michael crisscrosses the country yearly to visit manufacturers and attend trade shows, and occasionally gets as far afield as Europe. When he’s not running the kilowatts through power tools, Michael enjoys drumming and rustic woodworking with chainsaw, axe, and adze. What a terrific article. I am about to buy one, and your in depth review will guide me – along with price, of course.